Since the Civil Rights Movement, the inheritors of the animus that drove those opposed to racial equality have continually tried to co-opt the language of equality in order to continue oppressing one segment of the population or another. It’s gross, but it’s nothing new. 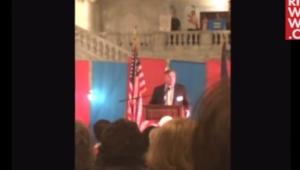 NOM’s Brian Brown spoke at an anti-gay rally in Utah Tuesday night and did just that. He explains that, in his view, those who are fighting to deny constitutional rights to LGBT people are the ones fighting for “true civil rights.” He also pays lip service to the idea that the anti-gay movement isn’t comprised almost completely of right-wing Christian wingnuts, listing off other religions that may be represented at the rally, but then assures the crowd that “it’s pretty likely that those of us here share some respect for our savior, Jesus Christ.” This gets a big cheer from the crowd of people, who have been led to believe that their religious perspectives should be the basis for our secular government. The good news is that, just as came to pass with King’s enemies, people like Brian are yet again on the losing side of history.